What is so special in Helsinki, Finland, Mr Putin and Mr Trump? World leaders travel the world without having to queue to the security check or immigration control, but sadly, they have few opportunities to take a sightseeing tour or interact with local people. Maybe Helsinki, the capital of Finland, is an exception. In the northernmost region of Scandinavia, Lapland, large herds of reindeer move around the wilderness freely. They are looking for food, adjusting to seasons, or simply escaping mosquitoes during the summer months. The number of reindeer is strictly controlled to ensure the animals don’t strain too much the sensitive Arctic environment. Every reindeer belongs to a herder, and that’s where modern technology can help. A popular method for tourists to absorb the landscapes and sceneries of Lapland is road travel. Roads maybe few, distances long and services infrequent, but very few destinations in the world has the same variety, wildlife and rough beauty as Lapland. Nordkapp (North Cape) is the modern pilgrimage destination located at the end of the world; it is the northernmost point of Europe. In Nordkapp, the road ends into the Arctic Ocean. Touring Lapland by car, motorbike or bicycle rarely presents a dull moment. Majestic, often lush, inland fell sceneries changes to rough and scarce Arctic landscape in the north as the Arctic Ocean gets closer. Following fell rivers that flow west introduces yet another scenery as the landscape transforms from fells to steep mountains and gorges, and picture-perfect fjords provide shelter for residents from the Atlantic Ocean. Lapland is all about nature and respect for the environment. People who live in Lapland say they have eight seasons: first snow, Christmas, frosty winter, crusty snow, departure of ice, midnight sun, harvest season and colorful autumn. The traditional life and livelihood has been tightly coupled with seasons that have determined how reindeers have behaved, and how hunting and fishing have been conducted. Summers are full of light in Nordic countries – that much we knew already, but the book The Lighter Side of Finland claims that it is not all grey and gloomy in winter, either. The book is an entertaining description of the Scandinavian country that is renowned for its education system, racing car drivers, and Nokia (well, used to be, anyway). For a tourist, the biggest attraction is the capital Helsinki, followed by Lapland, lake district in the East and the South-West archipelago. This book, however, is not a travel guide (even though it includes a few travel tips as well), but a warm and fun account of the culture, people, traditions, food and sauna etiquette. 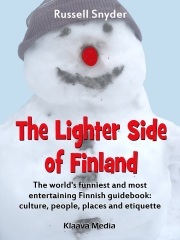 It is a well-written book that is a pleasure to read even if your next travel destination wouldn’t be Finland, but if it is, and you are interested what makes the nation tick, this book is worth your time. The best way for tourists to absorb the landscapes and sceneries of Lapland is road travel. Roads maybe few, distances long and services infrequent, but very few destinations in the world has the same variety, wildlife and rough beauty as Lapland. Nordkapp (North Cape) is the modern pilgrimage destination located at the end of the world; it is the northernmost point of Europe. In Nordkapp, the road ends into the Arctic Ocean. Lapland is all about outdoors: the natural environment is inviting for a hike, for a mountainbike trek or fishing in a river or lake. The Lapland guidebook describes the places where are the best hiking paths and ski tracks. Summers are bright and green in Scandinavia – that much we knew already, but The Lighter Side of Finland claims that it is not all grey and gloomy in winter, either. The book is an entertaining description of this Nordic country that is renowned for its education system, racing car drivers, and Angry Birds. For a tourist, the biggest attraction is the capital Helsinki, followed by Lapland, lake district in the East and South-West archipelago. This book, however, is not a travel guide (even though it includes a few travel tips as well), but a warm-hearted account of the culture, people, traditions, food and sauna etiquette.